Wildlife carers give their time and their homes to sick, injured or orphaned wildlife. These remarkable people see first-hand the devastating impact that excessive tree-clearing is having on the animals of southeast Queensland. With time running out for koalas along the Koala Coast, and localised extinctions already taking place, their work is more important than ever. 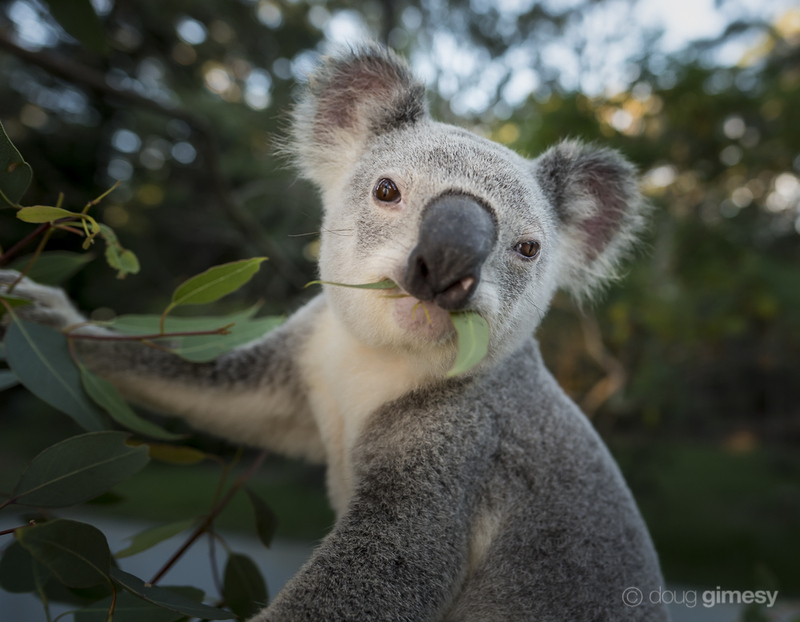 A young male koala, named Icarus, munches on a Eucalyptus leaf while in care at Return to the Wild Inc. He earned his name after he fell from a tree. 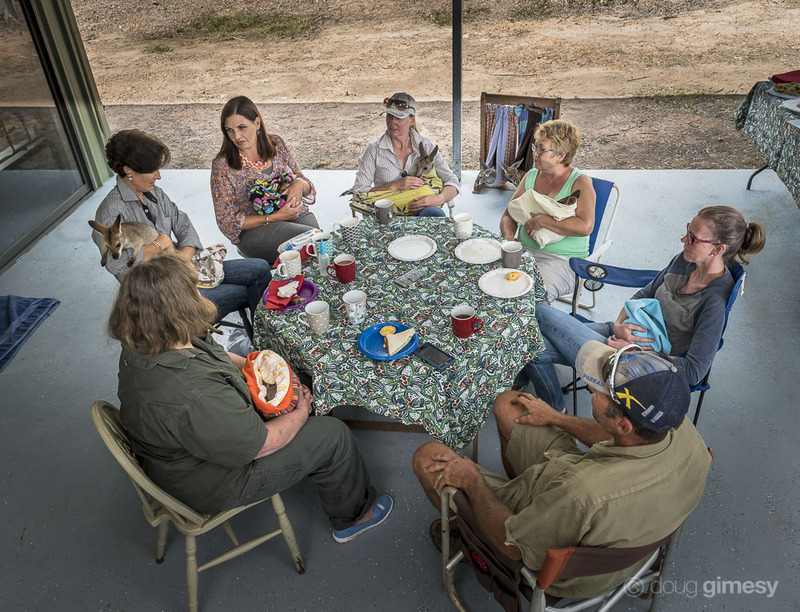 A group of wildlife carers meet to swap stories and caring tips over tea and sandwiches. Sharing the highs and lows of caring is as important to the carers’ health – giving much needed encouragement and support – as it is to the wildlife in their care. 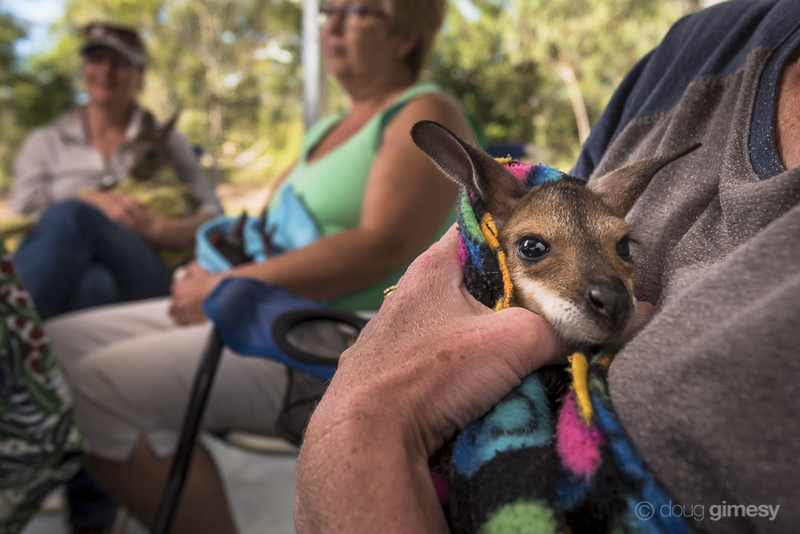 A red-necked wallaby joey, ‘Sadie,’ rests after a feed while her carer speaks to fellow-carers, Catherine and Sonya. 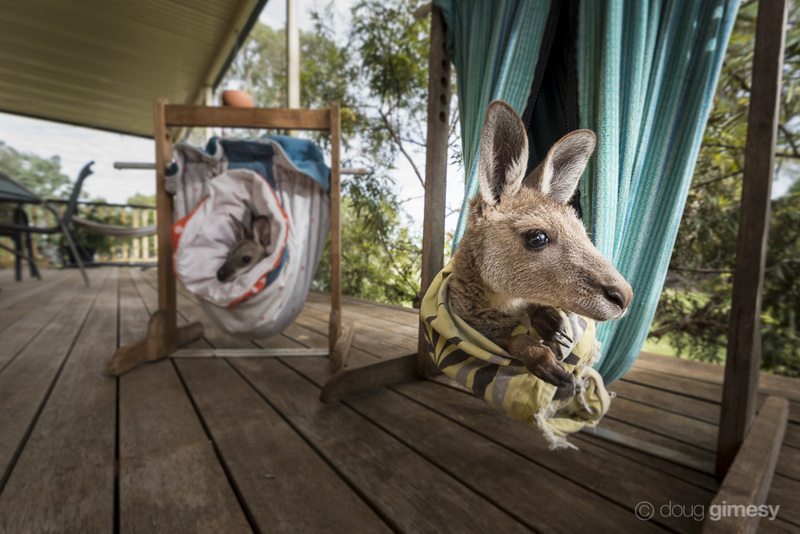 Young orphan wallaby and kangaroo joeys ‘hanging out’ on the back porch at wildlife carer and vet nurse Sonya’s property. These specially designed frames mimic their mother’s pouches. Sonya cares for wallabies and kangaroos that have been left homeless or orphaned until they’re ready to be returned to the wild. 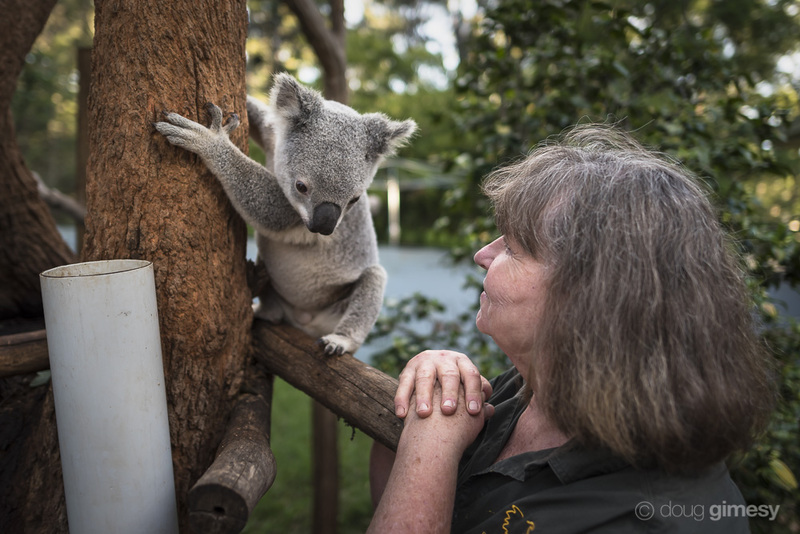 Wildlife carer, founder and president of Return to the Wild Inc., Clare,checks in with young male koala, Flynn. He’s been hand raised by Clare since he was a tiny joey. A koala’s main diet is Eucalyptus leaves which contain very low amounts of nutrients. This means an adult koala must sleep for 18-20 hours to conserve energy. 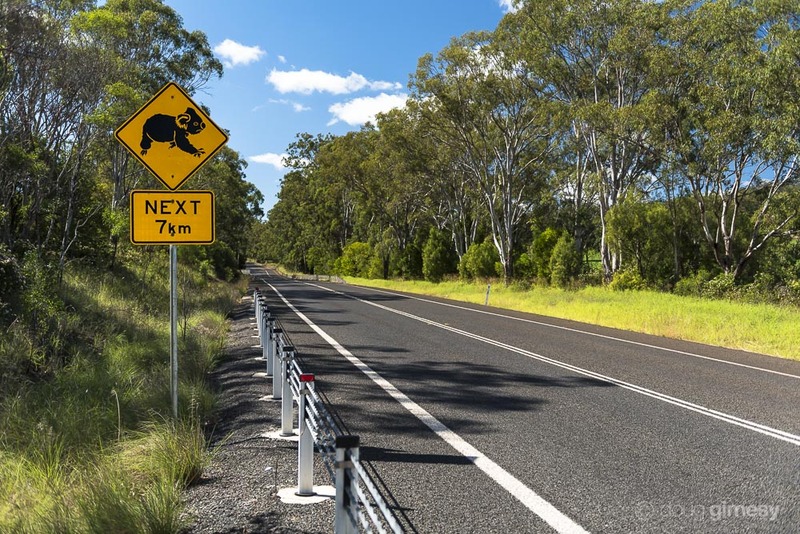 The Toowoomba region is home to many koalas, however excessive tree-clearing is putting them at serious risk. 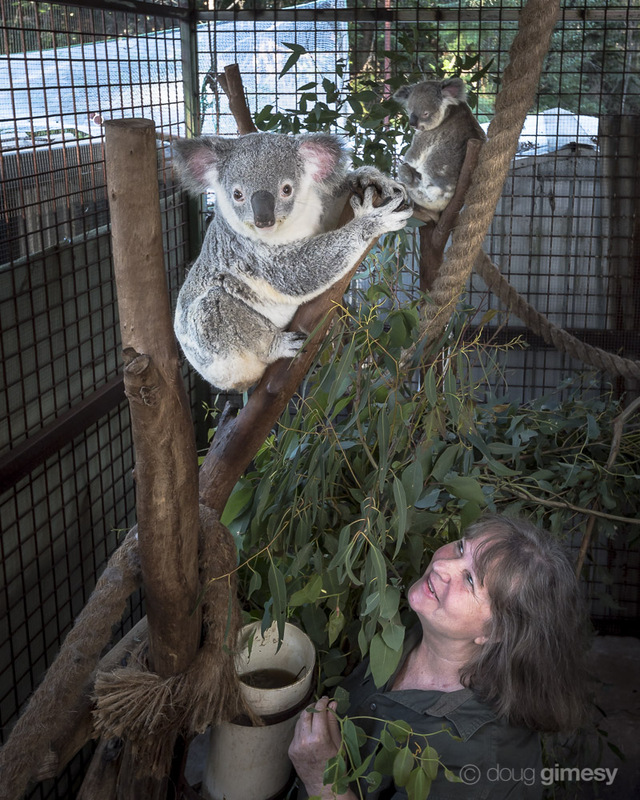 Local wildlife carers are concerned there will soon be nowhere for koalas to go. 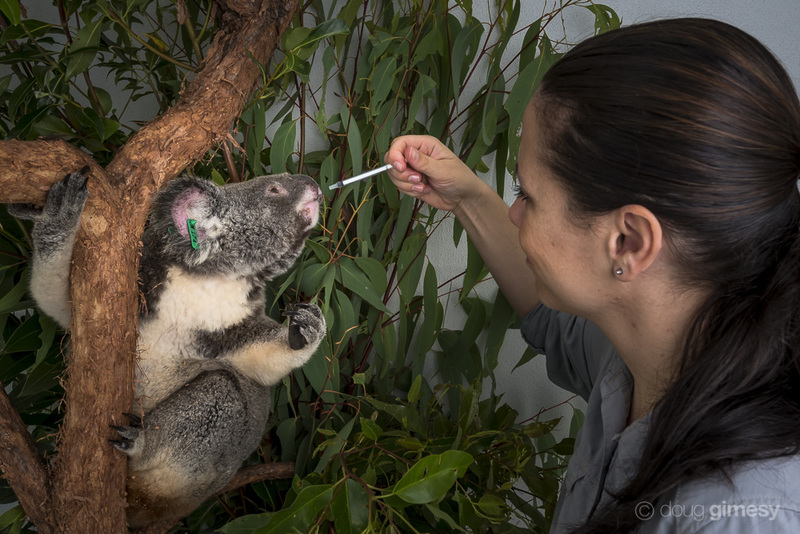 Jo Loader, wildlife veterinary nurse, giving treatment to a koala in recovery at Endeavour Vet Ecology. Toorbul, southeast Queensland. Dr Jon Hanger, Managing Director and Wildlife Veterinarian of Endeavour Vet Ecology, analyses the x-ray of a koala with a broken leg. The koala had been hit by a car but after some time in care made a full recovery and was released back to the wild. Koala carer, Clare, gives a female koala some fresh ‘browse’ to eat. 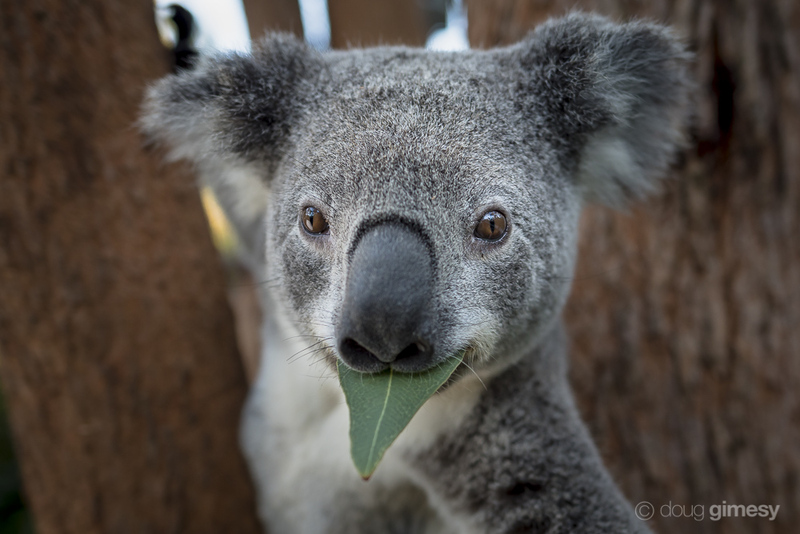 Supplying koalas with Eucalyptus leaves is never-ending work as koalas are fussy eaters.